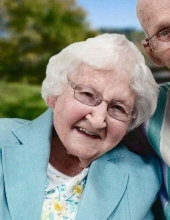 Jean Griffin, 95, formerly of Franklin, passed away on April 14, 2019 at UPMC Horizon in Greenville, PA.
Born August 1, 1923 in Erie, Jean was the daughter of the late Samuel M. and Helen Meyers Lippincott. She and her husband, Lewis Griffin, were married on February 28, 1946, and they were the first couple to be married at the Utica Presbyterian Church. Mrs. Griffin was a homemaker who enjoyed spending time with her family and reading. In addition to her husband, Jean is survived by her 2 daughters, Linda Smith of El Paso, TX, and Diane Davies and her husband, Ronald Jr., of Greenville. She is also survived by her 5 grandchildren, Karey Hardesty and her husband, Rod, of Odessa, TX, Kristie Smith and her special friend, Danny Diaz, of Albuquerque NM, Ronald Davies and his wife, Erin, of Elyria, OH, Michael Davies and his wife, Lee-Anne, of Landis, NC, and Michele Turner and her husband, Michael, of Chagrin Falls, OH; and her 7 great-grandchildren. In addition to her parents, Mrs. Griffin was preceded in death by her brother, Marvin Miles Lippincott. Family and friends will be received at the Gardinier Funeral Home, Inc., 1315 Chestnut Street, Franklin on Friday, April 19th from 11 a.m. to 1 p.m. Funeral Services for Jean will be held at the Funeral Home following visitation at 1 p.m. with Rev. Tina Kaye, pastor of Utica Presbyterian Church, officiating. Interment will be in Lupher Chapel Cemetery. The family suggests that memorial contributions be made to the Utica Presbyterian Church, 1957 Grant Street, Utica PA 16362. To send flowers, cards or online condolences, family and friends are invited to visit www.gardinierfuneralhome.com. To send flowers or a remembrance gift to the family of Jean Griffin, please visit our Tribute Store. Guaranteed delivery before Jean's funeral service begins. "Email Address" would like to share the life celebration of Jean Griffin. Click on the "link" to go to share a favorite memory or leave a condolence message for the family.